Is your credit union helping your youngest members become financially responsible now so they come to you later when they want their first car...first house? Or will you let the big banks' mass marketing take away a potential life-long member? Credit Union Teens Club offers your credit union a cost-effective, high-quality kids club to educate your youngest members about the importance of saving money. 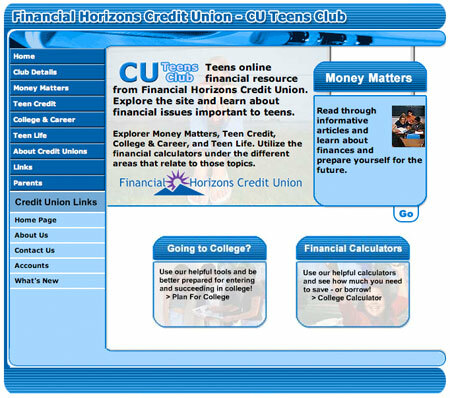 Credit Union Teens Club is a customized kids program with regularly updated articles, games, and activities! Choose from a Modular Stripes or Cool Water theme! New content added every month. Use Credit Union Teens Club style or your own colors and/or logo to make it your own. Includes online jigsaw puzzles and other activities for kids! You can edit any article online using your Web browser! Already Have a Program for Teens? We can co-brand the CU Teens Club Web site with your teens program logo, colors, and information! Take advantage of a pre-designed program that is flexible enough to make it look custom! Why Choose CommonBond's Credit Union Teens Club? CommonBond has been creating youth content for Credit Unions since 1999. Join over 100 other credit unions who have taken advantage of our high-quality youth content to educate and entertain their youngest members. You will have access to our team of writers, graphic artists, design professionals and Web developers who know credit unions - each has more than 10 years' experience in the credit union industry. All are dedicated to creating a program to suit your needs. You will have the most flexible Teens Program available. You can change every article that appears on your site, upload your own articles and graphics, or let us do the work for you with automatic updates. CommonBond has been serving Credit Unions for over 30 years. Your credit union will immediately benefit from our expertise in the field. What are you waiting for? Contact us for more information or to signup!